However, waiting this grant money for the last 18 months since the quake was like too many nightmares for him. And it was the last October when he received first tranche amount of 50,000 rupees ($500, out of $3000), though he had already began rebuilding on his own in last April as he lost his patience and could not wait further. “While building a new house, why not to build a bigger and stronger one”, Shrestha took it as a onetime chance to build back better. However, the first grant money was not enough even to construct the foundation wall so he took loan from the bank and started building three storey building at his road connected land where the old house fell down in the quake. He plans to rent his house for commercial purpose and reimburse the loan interests if rebuilding finishes in next six or seven months. The district office of Building Construction and Urban Development Dhading is situated in walking distance (5 mins walk) from the place where Shrestha’s new house construction is going on. But to reach and meet the government official at the same office, Baburam Bisunke, 50, walks for one and half hour almost every day from Tarukharka, Sunaulabazar Village Development Committee, some seven kilometers far from Dhading bazaar towards south. Like Shrestha, he had also received 50 thousand rupees in last October but that was all spent only in digging basement wall and arranging clay and stone. “If I could get the rest of the grant money at once, I would be confident to rebuild the house but the design, measurement and mapping troubled me a lot. I do not know when the government engineers will visit here and see it.” He said in rage. So, he has been visiting the government office everyday in the hope if something good happens for him. By profession a carpenter, Bisunke has recently purchased a new carpentry machine worth of 30 thousand rupees ($300). He expects to get carpentry jobs at Tarukharka if the rebuilding process gains the momentum in the village. But this is not happening, so he is upset. Baburam Bisunke is a Sarki or Dalit among 127 households at Tarukharka, where all of the households are Dalit. Other neighbors of his village have not started rebuilding their new houses either. 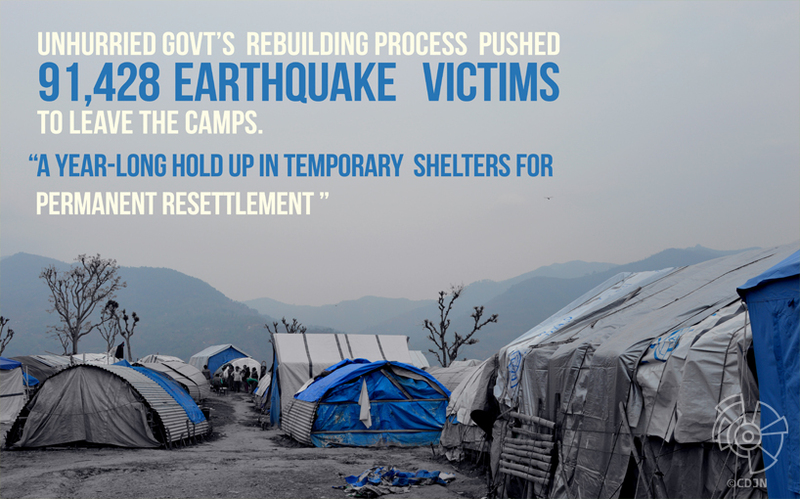 After the few months of earthquake, government and non-resident Nepalese from Singapore (Resham Adhikari) provided tin and wood to build temporary shelters. For them, these shelters now have become the permanent ones. Most of Dalit Sarki families have similar story that is ‘when to make new house?’. 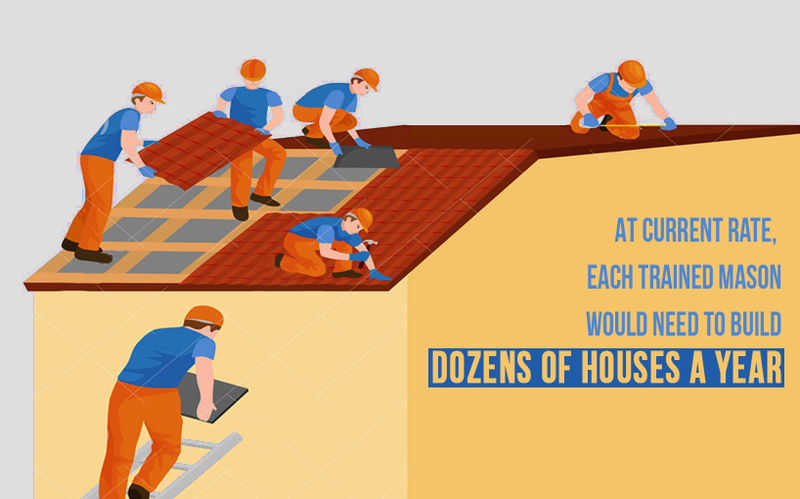 “According to the government criteria, design and building code, it costs about 800 to 900 thousands ($8K-$9K) rupees. So, the government’s endowment money only helps little, we are still not sure when the rest of the endowment comes in. Our sole efforts are not enough, there is lack of trained masons, the engineers were said to come but they have not showed up yet.” Baburam adds. The beneficiary name list made open by District Development office, Dhading shows at least 10,000 (out of 70,581) households belong to Dalit communities. In a ‘Tamang’ (a common ethnic surname) dominated district where more than 32,000 ethnic communities from different caste or surnames have been qualified to get the housing grants. Dilip Bhandari , head of Building and Urban Development office Dhading disclosed that so far only ten percent have completed rebuilding homes out of 70 thousand beneficiaries in the district. More than 65 thousand recipients have completed grant agreement with banks; however the process of disbursing first tranche is still going on. He blames the geographical hostility of Himalayan nation and lack of human resources are the reasons why technicians do not visit the villages to support and mentor people on the ground rather staying at VDC office chair to provide counseling. After laying manure from bamboo basket in her nearby land , Sita Nepali, 40, got back to her house and takes a breath of relief at front yard. Not only the day, she is also compelled to spend all night in her yard . After the devastating earthquake cracked her house room walls, she has been spending the cold nights by bending her legs with her four family members for the last one year. “Cooking stuffs and other home appliances are inside house but we are scared of sleeping inside. We don’t know when the cracked house is going to fall. For a year after the quake we stayed in tin shelter and another one year at yard. Because, we also have to look after the household appliances kept inside the cracked house so we chose to sleep in house yard with roof. Now we are inured of doing this.” Sita Said. By doing porter job Sita’s husband earns about six thousand rupees ($60) a month who received 50 thousand rupees housing grant money but due to cracked house he could not keep it inside so gave it to someone he trusts. Her eldest son left his house for Delhi, India when he was at grade three at local school. Now he earns about six to seven thousand rupees a month by doing dishwashing job. Another one son and two daughters are studying in elementary school. The rebuilding of house is a distance matter, this family is in still unaware about when to demolish the cracked house and fix the debris. It is not only Sita’s family that is stucked in the loophole of standstill in Tarukharka, there are many other Sarki dalit families whose condition is not different than her. Another Dalit Sarki woman Anita Saru Bisunke who was making Gundri (handmade hay mat) for herself says even she got the earthquake red card (beneficiary identity card) she has not yet received the first tranche of money yet. When her husband Govinda Saru Bisunke left for foreign employment in Qatar after the earthquake, she has been living with her brother-in-law along with her small children. The fifteen thousand rupees that her husband sends her from Qatar every month goes only to her children’s education and household expenses, so now, she is worried how she could be able to make new house. 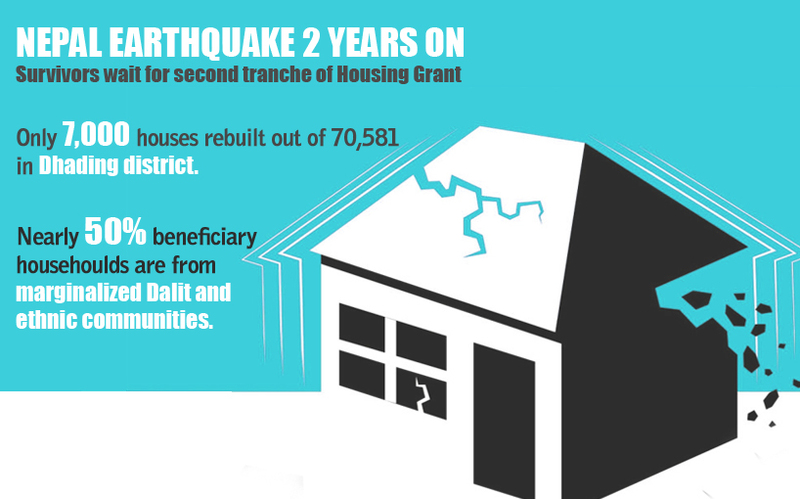 The 20 other Dalit families are living in the hope of getting first tranche since they had submitted the documents of house damage, Suraj Saru Bishunkhe tells. “Among those 20 earthquake victim families, some of them have got the earthquake victim identification card and some haven’t even made one.” Suraj said showing the name list. When they came to know that their names were missed in grant recipients list, they had filled written motion but it has been too late to be heard anything from the government, victims say. As per the ILO labor migration report 2015, 30 percent population of Dhading has migrated abroad for foreign employment, mostly on labor jobs in Arab countries over the past ten years. Due to open border policy with no immigration stamp for Nepalese, India has been a popular destination to work in a range of jobs. But, as a result the out migration to India can never be traceable because it is hardly documented. Somlal Saru Bishunke seemed busy with his elder brother Suraj Saru Bisunkhe fixing the debris of stones and woods all day. After finishing his work he kills his thrust by having a pot of water in his yard. After dropped out from primary grade , Somlal had been to India in employment for seven years. He shows the picture his old house in his smartphone. He returned to his native village from India to rebuild a house but he is discouraged now as the rebuilding work did not get the pace. He was in India during the earthquake. 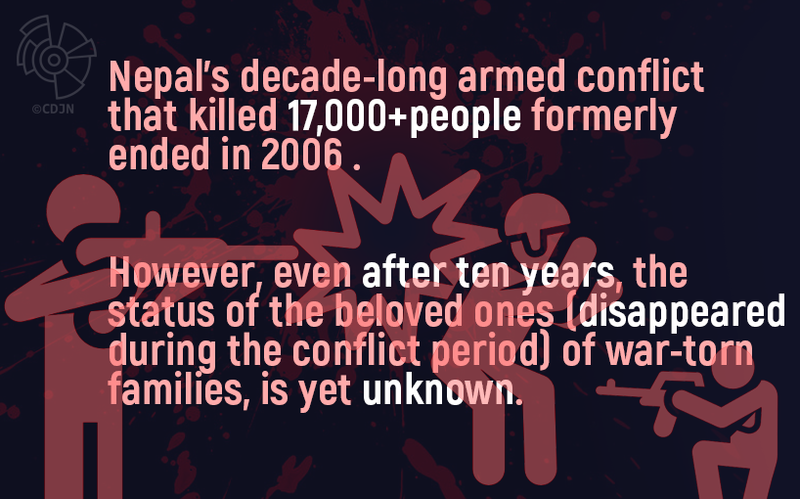 Among seven siblings of Somlal , four are still in India, one in Qatar and three are in Nepal. Somlal, Suraj and other two siblings are living in a same one family so they are willing to make a bigger house for all. They say it has already cost them one hundred thousand rupees ($1000). “Don’t know whether laugh or cry, the first grant money of 50 thousand rupees has been already finished”, the brothers spoke like as if they have forgotten the agony of last earthquake. Somlal and his all brothers had left school and gone for India when they were 4th or 5th graders. They say the monthly income of 15 thousand rupees was not enough to make new house on their own resources. They can only expect and ask, “If we had got the first and second installment of the grant money at once, we could at least start building the house”. We might arrange some more money by working overseas and support the reconstruction work with other loan plan or other possible arrangements. Rainy season is just four months away and this year’s cold season has almost about to elapsed, yet, the rebuilding process is pending for nearly two years. The Tarukharka Dalits express their fury toward the government authorities whenever some strangers visit Tarukharka village, the villagers think that government officials, engineers or NGO associates come to provide grant for them. Dalit has been defined as a non-homogenous group, speak different languages and have different cultures. What they have in common is their experience of caste discrimination and exclusion on the grounds of untouchability, leading to threats, intimidation, physical assault, forced eviction and displacement. The National Dalit Commission of Nepal decribes the Dalit community as ‘a community that has traditionally been subjected to untouchability and caste-based discrimination, and also has been extremely marginalized, excluded or deprived in social, cultural, political, education, administrative or economic sectors and deprived of social justice. Bhandari quoted the strict policy of National Reconstruction Authority which is - not to disburse the rest of the grant money ($2500) at once- as there could be possibility of misuse of funds. If someone has finished rebuilding a house as per the building code set by NRA, then he/she can be disbursed the whole or remaining amount, moreover, the second tranche money has been already deposited in the banks. “They can get a subsidized low interest rate loans from the banks in case they need to rebuild a house.” he stressed. “I will first try to make two-room house from three hundred thousand rupees of government grant may if it’s not enough, borrowing may be the option”, it was the thought of Juthe Sarki, 50, who was earlier excited but now has gone in quandary. His enthusiasm and courage both vanished when he saw the sample earthquake resistant house in Dhading bazar just 30 km far from Prithivi Highway in Charaudi. 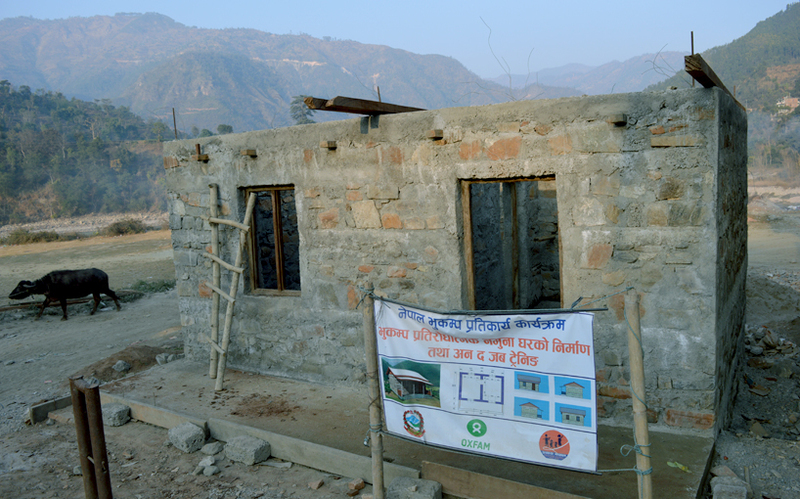 Recently erected with no ceiling and but ground floor, the sample house was made ready in partnership between Oxfam and local NGO Prayas Nepal. Though it has a simple outlook, the cost reached 14 hundred thousand ($14000) which made Juthe Sarki almost felt like suddenly falling from the tall building when heard about it. “To build a new house I thought it would cost about five hundred thousand rupees but this small house costs that much I am terrified, I think I can never make this kind of house. Juthe anxiously speaks out. “Among 17 governments approved seismic resistant models, this one with 42 sq. meter house having two rooms can accommodate 5-7 members of a family,” Ganesh Bika of Prayas explains. Bika reiterated that 16 masons were hired for on the job training for three months and all required construction materials were purchased by Prayas Nepal itself which cost 14 hundred thousand rupees. “5-7 houses have been built with six hundred thousand rupees ($600) in Dhusa VDC that is nearby, Ganesh said. After five hour long hilly-hazardous bus ride from Darkha VDC , Shamsher Bahadur Ghale (one of the generic surnames of ethnic community of Nepal), 60, arrived Dhadingbesi bazaar, the district HQ. He came to buy the building materials such as; iron rod, sand, cement and other construction materials with 40 thousand rupees, however, he was surprised when he roughly calculated the cost , six hundred thousand rupees ($6000) alone needed to transport the materials to Darkha. Adding 150 thousand rupees to first grant money received on last October, he was finally able to bring down earthquake damaged house. 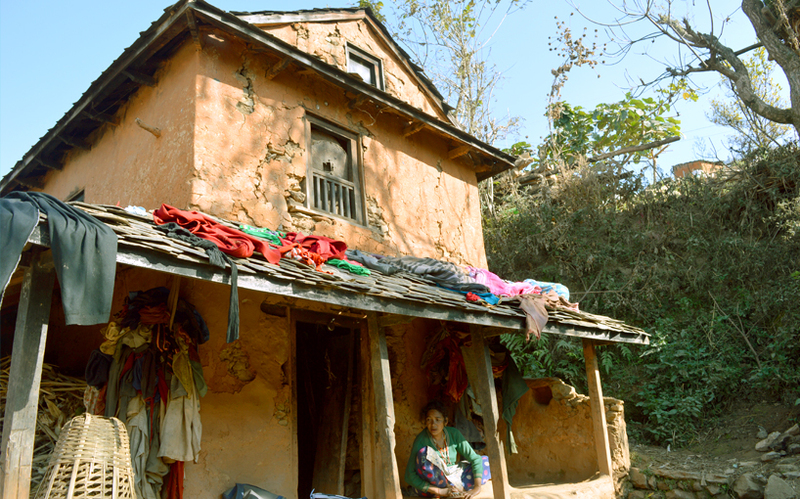 Ghale says he had made the basement with two rooms of size 130 square feet thinking that it is fit for his family of eight. He revealed that the price to completely rebuild a house will be more than 10 lakhs ( $10000). Tilak Dhungana, proprietor of Tankeshwor Hardware and Construction Supplies reckons that, the transportation cost differs from place to place depending upon the distance from Prithvi highway where the supplies get transported. 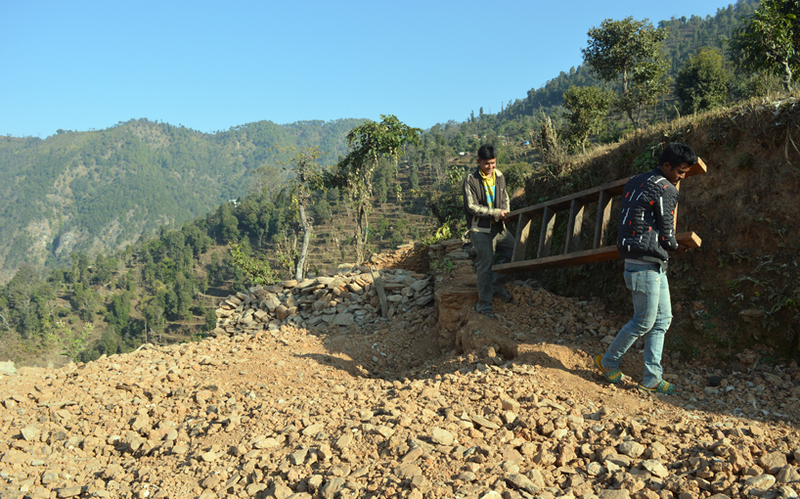 Bringing the materials up to Dhadingbesi to build a simple house (among 17 designs) can cost two lakhs ($2000). Tarukharka, not that much far from the Dhadingbesi bazar, however to transport same quantity of materials there, the price is three lakhs($3000), he added. 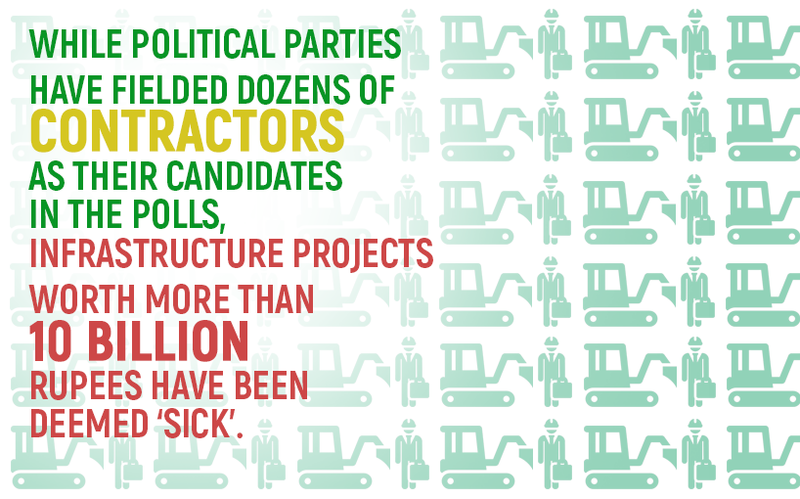 This messy image of Tarukharka’s rebuilding might raise further questions about how reconstruction is going on at other rural hard hit areas of Nepal. Earthquake survivors were confused with government decision to give $3000 housing grant money in a sense that it would be enough to rebuild a house. As things unfolded, in a changed tone, now government is saying that the money is only to support them. Despite the government efforts to provide low interest rate loans (up to $15K) for underprivileged communities, the Dalits are still puzzled about how to carry on rebuilding or dream for another big support at times when they are failing to move on. Note: This reporting project is supported by a grant from the Fund for Investigative Journalism in Washington, D.C, and is coordinated by the Centre for Investigative Journalism-Nepal and Lucinda Fleeson, an American journalist and Fulbright Specialist.